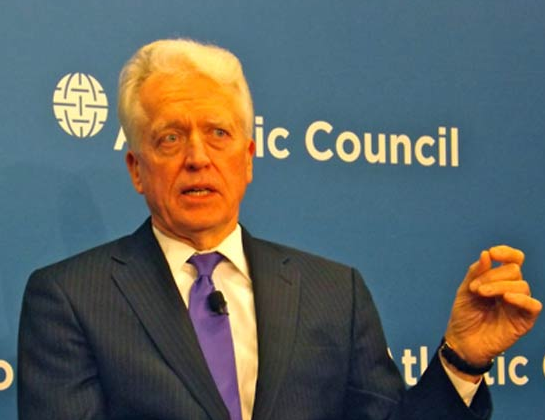 Appearing at the Atlantic Council in Washington, DC last week, former six-term congressman Rep. Jim Slattery (D-KS) said: “One of the great problems we have to overcome right now is ignorance, individuals in both countries have poor knowledge of each other." Jim Slattery was making the speech at the Atlantic Council after being the first former US congressman who has visited Iran since 1979. It seems however that all his 'interaction' attempts with the Islamic Republic officials has done nothing to diminish his own ignorance of the ruling religious dictatorship in Iran. Even before his visit to Iran, Slattery has been doing his best to "interact" with the Islamic Republic officials through the Abrahamic Dialogue interfaith initiative, yet astonishingly, it seems no amount of "interaction" is helping to reduce his sheer ignorance on the nature of the ruling theocracy in Iran. The Kansas Democrat seems to think he has found a commonality with his counterparts in Iran, religion! “Religion is a big part of their life, just as it is in Kansas” Slattery told the think tank audience. One would assume on the basis of this commonality he has discovered, he will in the near future, also initiate one of his "interaction" trips with the representatives of the Islamic State, as religion seems to be a big part of their life too. "the one thing they [Islamic Republic officials] yearn for, is respect,” Jim Slattery, the former Democrat representative shared his new found wisdom with the Atlantic Council think tank. The mind boggles at the stupidity of these Western do-gooders and how easily they can be fooled. I wonder as part of his "interaction tour", whether the former Democrat Congressman, also attended one of the Friday Prayer sermons held across Iran, where the faithful are urged to chant "Death to America!" during every Friday prayer, perhaps he would then been wiser as to what was really meant by "yearning respect". All this stupidity and ignorance reminds me of a time when I, myself, met some of the US State Dept officials at the time of George Bush's presidency. I was told straight away by one of them that "the US foreign policy was not about regime change in Iran, instead it was about changing the behaviour of the regime", to which I replied "Ah thats good! and how do you intend to change their behaviour?" "We have a website!" The US State Dept official replied. I was shown a website in Persian which promoted democracy and civil society and I assume the hapless diplomat thought that eventually the Iranian ruling clergy will stumble on this wonderful website and find the benefits and advantages of democracy and in time it will lead to a change of their behaviour. The only words I could find to say at the time was "Well, Good Luck!" and all I can say to the likes of Jim Slattery who attended a conference in Tehran on "combatting violence and extremism" is also "Well, Good Luck!". As I am sure if former Kansas Congressman was around at the time of Hitler, he may have also attended a conference organised by the Nazis on how to combat violence and extremism and came back and told his audience of well wishers, "All the Nazis yearn for is respect!" It's very hard to find a balance between being too warlike and being too appeasing. After the Afghanistan and Iraq Wars, many Americans concluded that their nation was too warlike so now they err on the side of appeasement. Hi Potkin! Long time no talk. Thanks very much for all the information and insight you keep posting. You are a world resource. Regarding this particular post, let me ask you, is it really ignorance? Or is it corruption and mendacity? The Slattery quotes are amazing. "Religion is a big part of their life, just as it is in Kansas." It does make you want to tell him he's not in Kansas anymore. And he is far from alone. Oregon congressman Earl Blumenauer is quoted on the Slate website disputing the idea that Rouhani can't be trusted, because "All of my friends who visited Iran as private citizens are struck by how friendly and outgoing Iranians are." Could a congressman really be that dumb? And what about Obama, who at the end of JUNE 2009 (!) stopped making even feeble criticisms of the murderous repression in Iran and called instead for negotiating with the mullahs about nuclear weapons, thus boosting them to the position of Official Opponents of the Superpower? Was Obama operating out of ignorance? If so, of what was he ignorant? His power? The effect of praising Khamenei (which he did)? The effect of letting the mullahs murder at will, while calling for "reaching out" to those bastards (as he and Clinton both did), thus presenting them as victims of US policy who needed a kind word? And what about the Republicans? Did their ignorance explain their failure to make political hay by pillorying Obama for deserting the Iranian people to those ruthless murderers? In 2008 Madeleine Albright wrote that the invasion of Iraq had the unforeseen consequence of helping the IRI leaders. Unforeseen? The National Security Council boys don't know that when you invade a country (or bomb it, as Albright did in 1998) you aid its deadly enemies? Invasion-planner Zalmay Khalilzad didn't know that? With so few brain cells could a person get through daily life, let alone become a major political player? Really, with so few brain cells, could a chicken cross the road? Contrary to your explanation, doesn't all this suggest that top Western leaders have a strategy and that the smaller fry (such as Slattery) are a) thoroughly corrupt, their liberal glaze notwithstanding, and b) know which way the hot air is supposed to blow? Whose side are you on, you fools?